Spent carbons from food grade process purification applications are reactivated in a separate furnace where there is no co-mixing with industrial carbons that could cross-contaminate the product. Reactivated carbons can help purify organic and inorganic chemicals, amine, and soda ash. 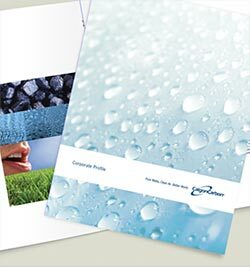 Additionally, Calgon Carbon provides activated carbon products and services that effectively decolorize certain chemicals, such as hydrochloric acid. Custom Industrial Reactivated Carbon (CIR) is often used for purification of Ultrapure water and bio-based chemicals. Our custom reactivated carbon can be used in food processing applications such as the de-colorization and purification of many different foods and beverages, as well as in the purification of water, liquids and gases prior to brewing and bottling. Pharmaceutical companies may rely on reactivated carbon for the development of antibiotics and vitamins. Calgon Carbon’s reactivation furnaces in Kentucky and Pennsylvania are fully permitted to accept RCRA hazardous spent carbons as well as non-hazardous carbons. In either event, the spent carbons are stored under water. The vent emissions are treated by carbon adsorption until the spent carbon is conveyed to the furnace for reactivation. Other company facilities offer reactivation services only for non-hazardous spent carbons. 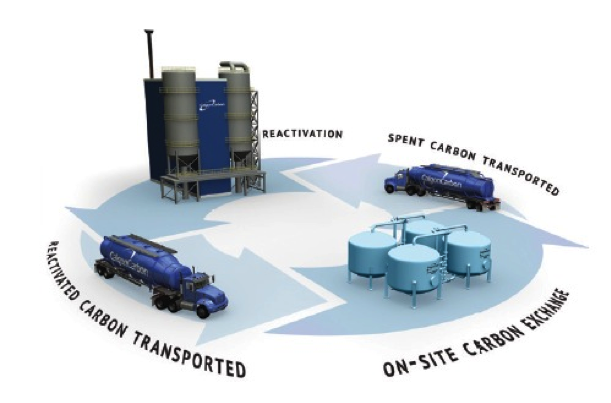 Once accepted for reactivation, we work with our customers to find the most cost-effective and efficient modes of return for the spent carbon. Common methods of return include super sacks (each holding approximately 1,000 pounds of carbon), flatbed trucks and bulk shipments by means of either Calgon Carbon private fleet potable trailers (more common at sites using steel pressure vessel filters) or dump trucks. Calgon Carbon also provides a host of top notch Field Services to remove and install the carbon in the most efficient manner – maximizing the customer’s economic benefit and minimizing disruptions to the operations.